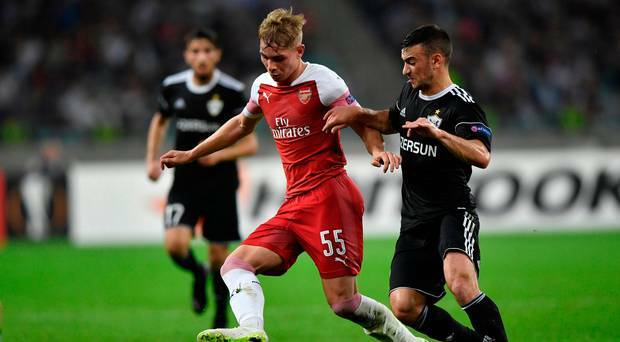 Arsenal youngster Emile Smith Rowe, has seen his dream come true as he has successfully made it to the senior and Premier League team of the London side Arsenal Football Club. Rowe has burst onto the scenes under the management of the new coach Unai Emery. In a report by The Telegraph report, top football clubs like Chelsea, Barcelona and Tottenham have all made attempts and approaches to sign the young star player even if he was just 15-year-old then. Chelsea who spotted the player as a youngster have tried any possible means of signing the player but he took his stand on remaining and playing for Arsenal. Smith Rowe has always dreamt of making it to the Arsenal first team and he has finally made it through this season at the age of 18 under the new manager. He was handed his first-team debut and given the opportunity to play in the Carabao Cup this season and has also been featuring in the Europa League matches. Hopes of signing the starlet by Tottenham and Chelsea is now lost as the player is now playing for Arsenal and not ready to leave anytime soon.